Tidewater Community College’s engineering program prepares students to transfer to four-year institutions for baccalaureate studies. While at TCC, students have ample opportunity to put classroom knowledge to work in hands-on applications. 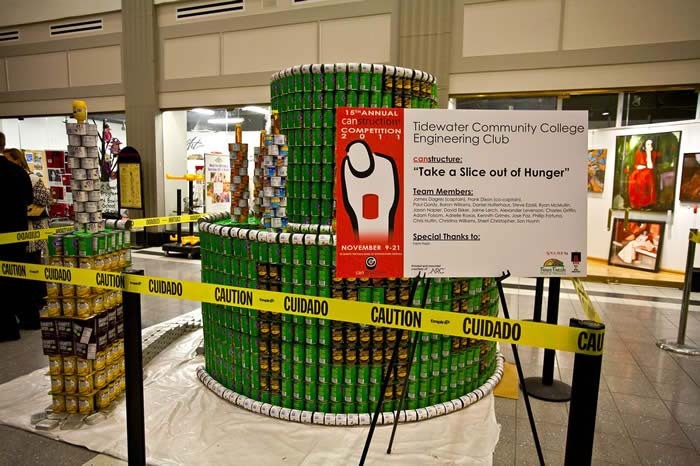 This November, for the 14th year running, TCC’s Engineering Club fought hunger in Hampton Roads by creating a masterpiece out of cans. As participants in Canstruction, the group designed and built a super-sized structure to shed light on hunger concerns in the area. This year, the TCC team chose a theme of Take a Slice out of Hunger, illustrated by a large, double-layer cake, with a missing slice and illuminated candles. The five-ton entry won two awards: Most Cans and Best Meal. Led by student team captain James Dagres and faculty advisor Paul Gordy, head of TCC’s engineering program, this year’s Canstruction team had more than 25 members. On the evening of the build, Nov. 9, in Norfolk’s Selden Arcade, the group had just six hours to construct the structure out of 10,532 cans, which were donated by Farm Fresh. next “pull” through the sand. TCC engineering students also test their engineering know-how through a variety of competitions including bobots – mini robots that battle in the sand – and cable cars, mini vehicles with specified motors and 9V batteries that zoom on a high-wire track. Budding engineer designers from TCC and Virginia Beach high schools compete with an excited audience watching, as cars careen around the course and crazily cross the finish line. TCC’s Engineering Club promotes learning by inviting industry-savvy speakers to campus, organizing field trips to firms and participating in community events. Students have opportunities to participate in apprentice programs and internships, and can take classes at the Virginia Beach Campus, Chesapeake Campus and the Tri-Cities Higher Education Center.